I think this is the ultimate Canada Day dessert with it’s red and white colour scheme and local berries at their peak! 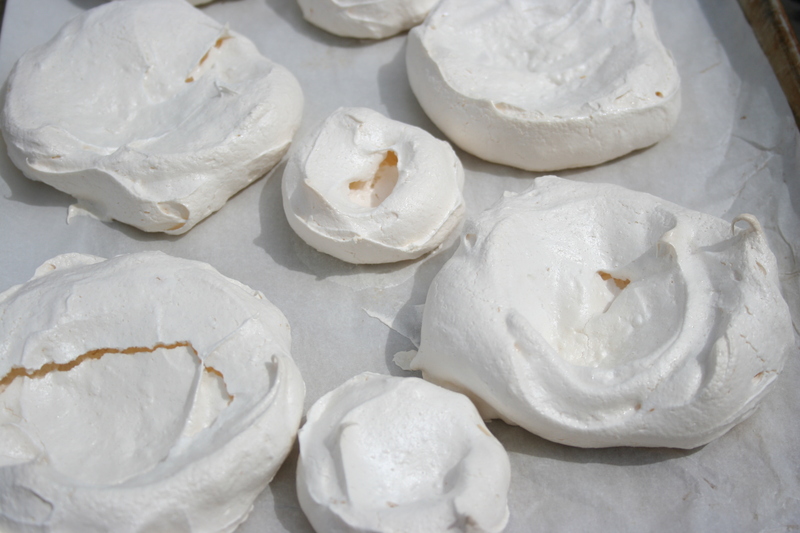 You can make individual or family size meringues and they are so portable for picnics or potlucks or camping. Put them together when you are ready to serve! Use a handy can of whipped cream if you are not at home. This morning I was able to spend time at our local berry patch, Morrison’s Berries, http://ontariofarmfresh.com/member-pages/morrison-berries-country-market/ listening to the birds and enjoying the summer holiday while picking a basket of strawberries. I seldom pick more than 6 quarts of berries at a time. That way I have an excuse to go again and again and it does not become a chore. 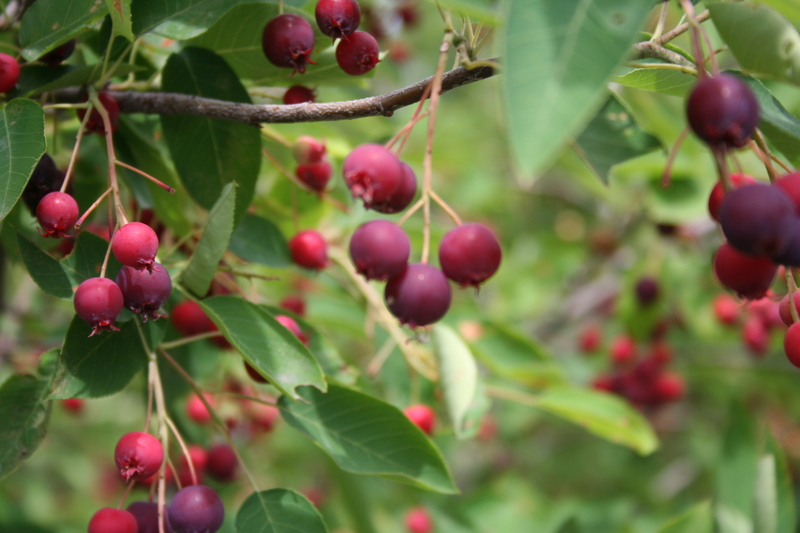 To make our pavlova even more of a Canadian treat we harvested our first Saskatoon berries from bushes in our gardens. They are really abundant this year and taste like a cross between a currant and a blueberry and I think they will mix in nicely with the strawberries on top! Whip egg whites and cream of tartar in a clean bowl with clean beaters until soft peaks form. Gradually beat in sugar until stiff peaks form then stir in vanilla. Spread all of meringue in a circle on parchment*lined baking sheet using a spoon to smooth and indent the centre slightly. I have also made individual meringues using a muffin scoop. This will make about 7- 8 individual forms. hot mix into the yolks first to temper them. Return to microwave and bring back to a boil, about 2 minutes. Remove and add butter and vanilla, stirring until smooth. Place a piece of waxed paper or plastic wrap on top to keep from forming a skin and let cool.Cover baked meringue with cooled custard and berries. Top with a little sweetened whipped cream. * You may use foil instead but lightly grease it before spreading meringue. 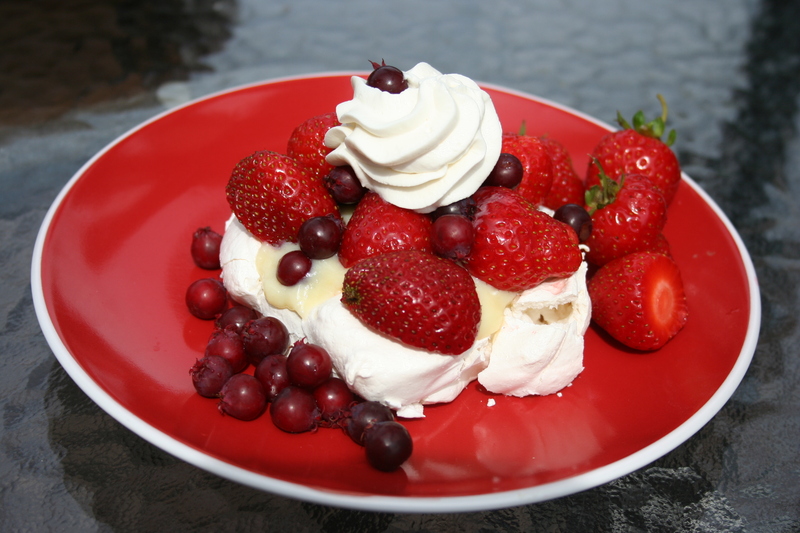 This entry was posted in Gluten-free Adaptations and tagged Anne's Favourites, Canada Day dessert, celiac, egg whites, gluten-free baking tips, meringue, Pavlova, strawberries by Anne's Favourites. Bookmark the permalink.